Asheville Design Works is a creative studio specializing in solutions that serve the needs of our clients, rather than the dictates of design fads. We’ve been around (under one name or another) for two decades, and worked with large and small businesses locally, nationally, and internationally. We offer an integrated approach that encompasses all of your marketing strategies, from logo design to web development to print collateral. We can make your web presence stand out from the crowd. Every project is built from the ground up—we never use templated designs—and each is fully responsive, so it looks its best on any device. Your identity can be one of your greatest assets. We strive to craft the right identity program for you, and make sure it works across all all applications, to give your business a consistent personality. There was a time when all design was done for print. Our experience dates back to that time, and we know print design from top to bottom. Brochures, books, pamphlets, catalogs...we do them all. Sport Hansa, founded in 2010, is an importer of European outdoor product lines, supplying over 300 retailers. 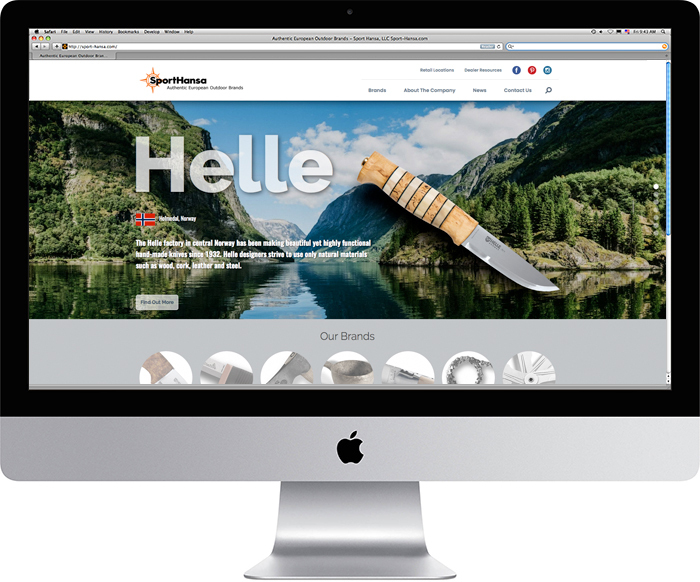 Owner Matt Huff needed a website that would serve as not only an attractive marketing tool to add more retailers, but also an information hub between retailers and his company, which could provide those retailers with such items as image files, price lists, and trade show dates.